June is typically a time where humans graduate from schools of various levels — such as grade schools and universities. The American Society for the Prevention of Cruelty to Animals (ASPCA) is hoping to have a few graduates of its own; namely, hundreds of cats, dogs, kittens, and puppies in its shelters move to permanent loving homes. 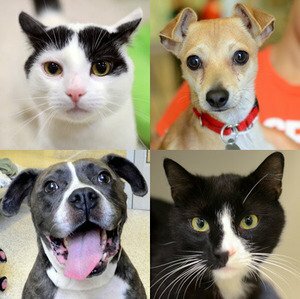 Some of the cats and dogs available for adoption at the ASPCA’s New York City Adoption Center. Anyone who adopts an animal from the ASPCA’s New York City Adoption Center on Saturday, June 16 and Sunday, June 17, will get a surprise gift. There’s also a deal on cats: if you adopt one, you get a second one for no charge. And cats that are more than three years of age? They’re absolutely free. To sweeten the deal, all animals are spayed or neutered, vaccinated, microchipped, and each comes with a carrier or leash. The adopted animal also gets one free follow-up visit to the ASPCA Bergh Memorial Hospital (within a limited time after adoption). For more information, please check the ASPCA’s website for the NYC Center’s address, hours of operation, and more.